COMPACT, LIGHTWEIGHT DESIGN: Space saving, lightweight portable and durable temperature and humidity meter features a "kickstand" so you can place it on your desk, a side table or even your kitchen counter. 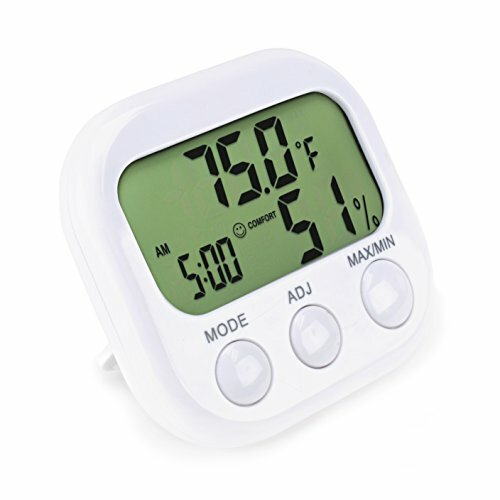 PROTECTS YOU AND YOUR FAMILY: Apart from being a clock and a thermometer, this product is a precise hygrometer Knowing your home's humidity level is essential to improving indoor air quality and the overall health and comfort of you and your home. The Environmental Protection Agency (EPA) suggests maintaining the acceptable range of humidity for a healthy home is 30-50%. YOU ARE GUARANTEED A RISK FREE PURCHASE: Keeping you satisfied is a top priority. To make sure we meet all your needs and demands, we offer you a 30 day no questions asked product return. If you have any questions about this product by iapsales, contact us by completing and submitting the form below. If you are looking for a specif part number, please include it with your message.